Relationships and Triathlon- Tips for Being in a Relationship With Someone Other Than Your Bike — James Thorp. Triathlete. My first year racing as a professional athlete has enabled me to be surrounded by some incredible athletes. These athletes share a lot of similar qualities. They are passionate, dedicated, motivated and committed. They also dedicate a lot of time and effort to being successful athletes. These are not only the qualities that are necessary in order to be successful in triathlon, they are also the same qualities that are needed to be successful in a relationship. For this reason, it's inevitable that at times there will be a clash between your two loves- your bike and your significant other. In 3.5 years I progressed from being a slightly overweight party animal to having a (what I would consider) successful rookie season as a professional triathlete. Being in the same relationship throughout taught me a lot of important lessons in how to make things work while training and racing. Some things I learned through having great times and some through making mistakes. That's life. You live, learn and get better. Here are some things I have learned. 1. 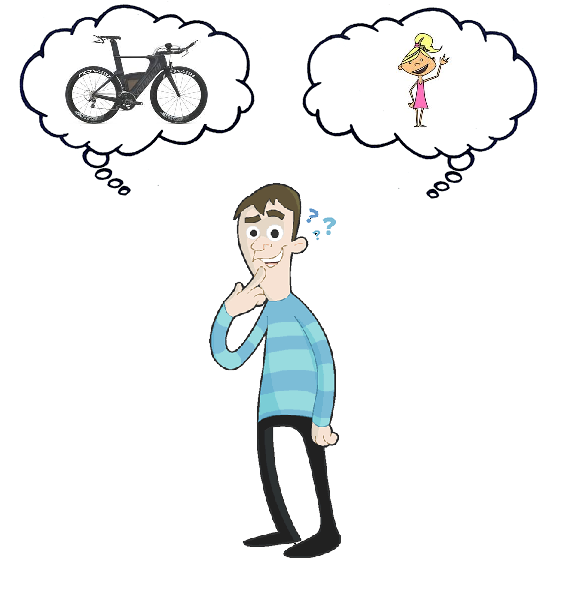 Support your partner's interests just as you would like them to support your triathlon. If your significant other isn't a triathlete, sitting around waiting to see you come past once or twice a race may not be the most exciting thing in the world. Supporting can be just as stressful as racing at times. After you are done with the race/awards etc it is time for you to repay the favor and do something for your partner. 2. Work together with your partner to plan your season. Going away to exotic places to race can be fun, but it can also be very stressful. Talk through your plans and goals with your partner at the start of the season so you are both on the same page. If you are able to travel together for races keep your partners interests in mind and maybe add a day on the end to do something they enjoy. If you have to travel alone then cut the traveling down as much as possible. While you are away traveling take a step away from the buzz and hype of the race site to call home and see how things are going. 3. Work together to establish your training for the week. Triathletes are extremely organized people. If you know you have a long hard ride coming up on Sunday morning you may not want to go out that Saturday. Discuss this with your partner and maybe you can rearrange to have a night out on Friday instead. 4. Consider how you discuss triathlon. There are some things about triathlon you should share. Results, goals and ambitions as well as your training and racing schedule are all things that are great to discuss. It takes a special person to listen to a conversation about how many watts you saved by changing the angle of your drink bottle. I have been in the room with people that love cycling and often even they can't stand it. When these topics come up too often be mindful and change it to something you can both enjoy talking about. 5.Care for your partner more than you care for your bike. Having three in the bed is too many. Especially when one of them is a bike. Pay your partner greater love and affection than your bike. Don't spend all your money on aero drink bottles you are never going to use. Instead spend it taking your loved one out to a movie and dinner. In my two years in the sport I have come to realize that triathletes are great people. Some of the most ambitious and free people I have met are triathletes. The qualities shared by these athletes are the same qualities needed for a successful relationship. The important piece of the puzzle just becomes fitting your love of triathlon in with the love of your life, not the other way around.